Once the work week is over, everyone needs to blow off a little steam. 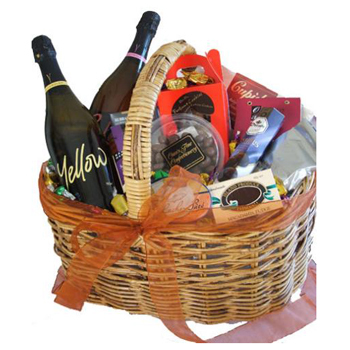 Send your friends a much needed excuse to party with this relaxing gift basket. Your recipient will receive a bottle of Yellowglen Yellow Sparkling Chardonnay (750ml), a bottle of sweet Yellowglen Pink Sparkling Wine (750ml), bright Random harvest Sundried Tomato Tapenade (140 g), sweet Random harvest Old Fashioned Raspberry Jam (140 g), a pack of crisp Rocca's Deli Gourmet Crackers (110 g), Sinclair and Flemming Passionfruit Stars (100 g), tempting Droste Extra Dark Chocolate Pastilles (100 g), and so much more. Say Happy Birthday, celebrate the weekend, or treat yourself to a Late Night.